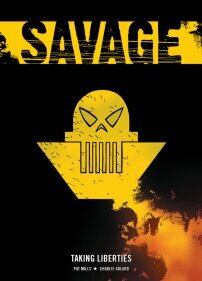 For over three decades one British comic has defined a generation: 2000 AD. 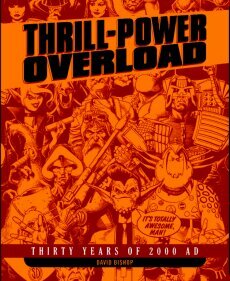 From humble and rocky begginings to its current position as the Galaxy's Greatest comic, Thrill-Power Overload charts the incredible history of this ground-breaking comic. With exclusive interviews, hundreds of illustrations and rarely-seen artwork, former 2000 AD editor, David Bishop, guides the reader through three decades of action, adventure, excitement and the occasional editorial nightmare! Told by the people who were there, this is the definitive history of the comic that launched a thousand talents. By Pat Mills and Charlie Adlard. In 1999, Britain was invaded by the Volgans, led by the despotic Marshal Vashkkov. With a puppet government installed, the United Kingdom was quickly under oppressive military rule. When London lorry driver Bill Savage discovered his family had been killed by a stray Volgan shell, he began a one man war against the aggressors. He escaped to Canada, but in 2004 ­ with help from the CIA ­ he returned under the identity of his dead brother Jack and continued to lead the resistance. Now the streets of London will be awash with Volgan blood in one of the bloodiest uprisings yet! Written by Pat Mills (Sláine) with art by Charlie Adlard (The Walking Dead) this grim tale of an alternative England shows 2000 AD at its confrontational best! By John Wagner, Alan Grant and Carlos Ezquerra. THE MAN WITH THE X-RAY EYES! 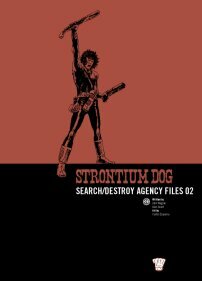 In the far future Strontium-90 fallout has created a race of mutants, outcasts from society, despised by the 'norms' and given only the dirtiest job ­ bounty hunting. Johnny Alpha is one such mutant, working for the Search/Destroy Agency, hunting down the criminals for the Galactic Crime Commission. The second volume in this thrill-packed series collects together such classic stories as 'Portrait of a Mutant', 'The Killing' and 'Outlaw' along with a bonus strip and an extensive covers gallery.